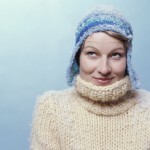 How to keep warm is a major concern of home workers in these days of rising fuel prices. So we tested a Slanket. A Slanket is a big fleece blanket with sleeves and our sample was white with brightly coloured giant polka dots. My husband immediately seized it and wrapped himself up. He looked hilarious – like a massive baby in a babygro. But you can also get plenty of plain, more understated colours. It’s 100% polyester, as garments to keep you warm usually are, and let’s face it, nobody’s going to buy one for the style factor. Perfectly well put-together for something that is a large piece of fabric with just a couple of seams for the sleeves. A few long loose ends on the hems. At first I was putting it on with the opening at the front, like a coat, then I realised it’s meant to go on the other way. You have to shake it out to find the armholes, fold down the collar, and wrap it round so there are no draughty gaps at the back. Being short I had about 2 feet of excess fabric at the bottom, to wrap up my feet in. Although that may not work as well if you sit in an office chair and habitually put your feet on the base, which tends to allow for chilly gaps. A little irritating if you need to get up to get something out of the filing cabinet, make a drink, or go to the loo. You either have to gather up your bulky polyester train and try not to knock things over en route, or disrobe and then go through the wrapping up process again when you sit down. This could actually work in your favour by keeping you at the desk longer than if you can wander off unencumbered – the Slanket as productivity enhancer! But if the doorbell rings you’d have to take it off unless you don’t mind acquiring a reputation for being completely round the bend. The sleeves are very wide, which can be draughty, but you can fold them over and rest your arms on the excess as you type. The Slanket kept me cosy in an unheated home office, although a little cooler around the legs where you don’t have the benefit of contact with your chair. Slankets for adults start at £25 plus delivery charge, so if it means you can keep the heating off it’s a good investment. I’m sure it would wash well and dry quickly, and no doubt the synthetic fabric will last for ages. And of course you can also wear it after work to curl up on the sofa with a book or to watch television. home workers who are able to wrap up and stay put for a few hours and are unlikely to get any visitors. Thank you to Slanket for supplying us with a Slanket for our How to Keep Warm reviews.